Quilt Kits make it easy to get started quilting right away! Pre-coordinated fabrics take the guesswork out of material selection, with colors and patterns that match perfectly every time. We've been adding to our selection of quilt kits, with comfy quilt kits for baby and decorative wall quilts for the home. You can see them all in the Quilt Kits section of the store! We have a new selection of Cuddly Quilt Kits from Fabric Editions. Plush fabrics, soft flannels, and quality cottons give these quilts a warm & cozy feel. Perfect for baby! 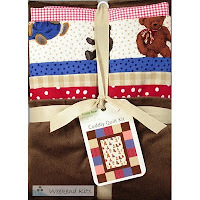 The Teddy Bear Baby Quilt Kit includes fabric for the quilt top and backing. Easy instructions provide step-by-step guidance for cutting the fabric pieces, assembling the blocks, and finishing the quilt. Finished baby quilt measures approx. 30" x 36". Red, white & blue fabrics and old-time teddy bears add to the nostalgic, Americana appeal of this quilt. Works well for boys or girls. It's important to note that the fabrics in this kit should not be pre-washed. Once your baby quilt is complete, it's OK to machine wash using cold water and a gentle wash cycle. After washing, lay flat to dry. The Little Lamb Baby Quilt Kit features spring-themed fabrics with little lambs and baby chicks. This cheerful quilt design uses soft shades of pink, green, and yellow. Perfect for a sweet baby girl! 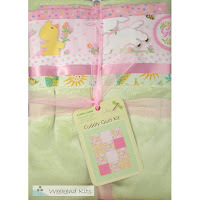 Cuddly Quilt Kits are an ideal quilt kit for beginners looking for an easy quilt project. They're also a convenient quilt kit for experienced quilters to make a quick & easy blanket for baby. Rotary cutter, cutting mat, and ruler for cutting fabric pieces. Sewing machine for stitching blocks and rows together. Scissors, seam ripper, straight pins, needle, and thread. Dry iron for pressing seams down and a press cloth for protecting plush & satin fabrics. We've also been adding to our selection of Wall Quilt Kits from Rachel's of Greenfield. Rachel's complete quilt kits make it easy to create a beautiful wall quilt for your home. The Homespun Stars Wall Quilt Kit includes all of the premium cotton fabric needed for the quilt top, backing, and binding. Even the batting is included! Complete patterns and step-by-step instructions for making the quilt are provided. Quilt designs are also included. Finished wall hanging is approx 22" x 22". 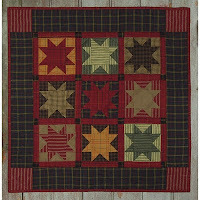 The rustic homespun fabrics used in this wall quilt will add country charm to your home decor. Also makes a nice housewarming gift for a friend. 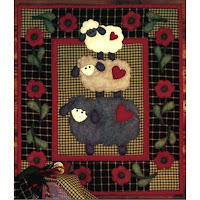 The Wooly Sheep Wall Quilt Kit is a delightful quilt for a bedroom or any living area of the home. This applique quilt kit includes all of the fabrics needed to complete the quilt. Cotton fabrics are used for the quilt top and backing. Woolfelt is used for the applique. Batting, buttons for eyes, complete patterns, illustrated instructions, and full size templates are all included. This is one of Rachel's smaller wall quilt designs, with the finished quilt measuring approx. 13" x 15". Rachel's quilt kits offer affordable quality! See our complete selection in the Wall Quilt Kits section. Kits make it easy to create a warm quilted blanket for baby or a decorative wall quilt for your home. Visit Weekend Kits today and be ready to start quilting on your next Weekend at Home! Knitting for Beginners - Learn to Knit Starter Kits! Knitting is a creative needleart craft that is as popular today as ever. If you have children interested in learning to knit, you won't want to miss these new product arrivals. Everyone in the family can get started knitting! 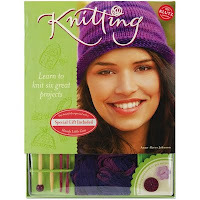 You'll find knitting kits for beginners of all ages in the Knit & Crochet Kits section of the store. 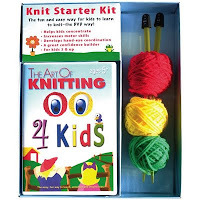 The Art Of Knitting 4 Kids Kit & DVD from Leisure Arts is a beginner knitting kit for kids. This is an excellent starter kit for introducing children to knitting. Kit includes a learn to knit DVD, knitting needles, and medium weight yarn. The instructional DVD is a great way for kids to learn how to knit. They'll watch 3 instructors demonstrate basic knitting techniques. Learning via a how-to DVD is especially helpful for visual learners. The DVD is designed to entertain kids while teaching them to knit. Kid's will be inspired as they watch a 7 year old teach the basic knitting stitches. Then, they'll get started on their first knitting project with an easy-to-knit ball & toy stitch-along. Learning new skills is a great confidence builder for children! The Knitting Book & Kit from Klutz is a complete beginner knitting kit for preteens and teens to learn to knit. Kit includes everything you need to get started, including an instruction book, knitting needles, worsted weight yarn, crochet hook, yarn needle, and two pretty buttons that coordinate with the yarn. Klutz books are known for their high quality standards and the Knitting book by Anne Akers Johnson is no exception. It's a 93-page knitting book designed to teach & inspire beginners. Step-by-step instructions for six knitting projects are included. Teens will learn to knit a warm hat, skinny scarf, stylish purse, and more! Beautiful color images are included throughout the pages. 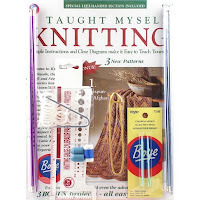 The I Taught Myself Knitting Kit from Boye is a beginner knitting kit for adults. Kit includes a softcover instruction book, two pairs of knitting needles, point protectors, knit tally, cable stitch needle, stitch holder, tapestry yarn needles, cabone rings, and knit gauge. The I Taught Myself Knitting book uses simple instructions and clear diagrams to teach the basic knitting stitches. A special left-handed knitting section is included. A variety of easy knitting patterns are included. All you need is some yarn and you'll be ready to get started knitting! Visit the Knit & Crochet Kits section for details on these kits and to see our complete selection of knitting kits for beginners. Winter is the perfect time to learn to knit and kits make it easy to get started right away. Stop by Weekend Kits today and be ready to start knitting on your next Weekend at Home!